For a slight change of pace in our tour itinerary, we made a stop at Scheveningen Beach to enjoy some seaside scenery. Scheveningen is one of the eight districts of The Hague. It is the most popular seaside resort in the Netherlands and there are many attractions on the beach, but the one thing that surprised us all on arrival here was that bootscooting seemed to have overtaken this beach resort in a big way. To get to the beachfront we walked to the promenade in front of the Kurhaus Hotel to find the plaza area full of cowboys and cowgirls bootscooting to the sound of country western music. It unhinged us a little as the beach promenade full of bootscooters was atypical of our experience of the Netherlands so far. Everyone, young and old, experienced and inexperienced were doing their best to bootscoot to the music of the live band. We squeezed our way to the beachfront to find yet another group of people, a smaller one though, bootscooting as well. 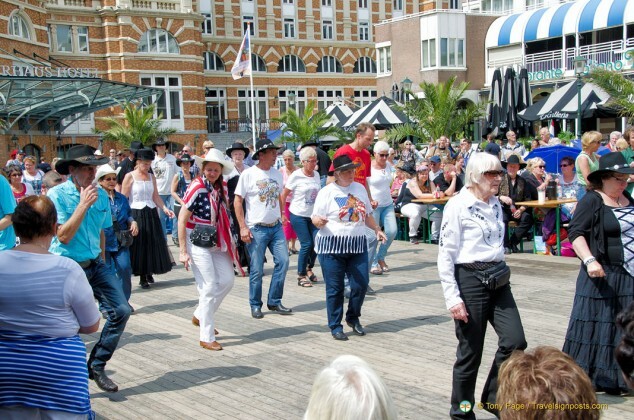 What’s happening in this part of the Netherlands I wondered, why is everyone bootscooting in Scheveningen – there wasn’t any billboard or poster advertising any event. 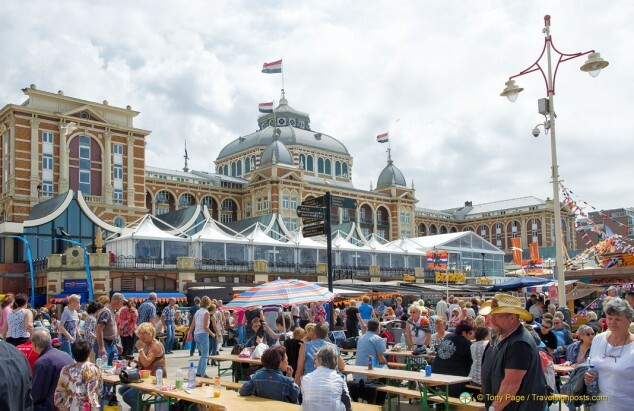 I was relieved to find out later that we weren’t in some kind of time warp and that we had actually walked into a Scheveningen “Western Experience” – a country and western festival with live music and line dancing. So once we had gotten over the ‘bootscooting’ puzzle, we were then able to focus on what else Scheveningen had to offer. 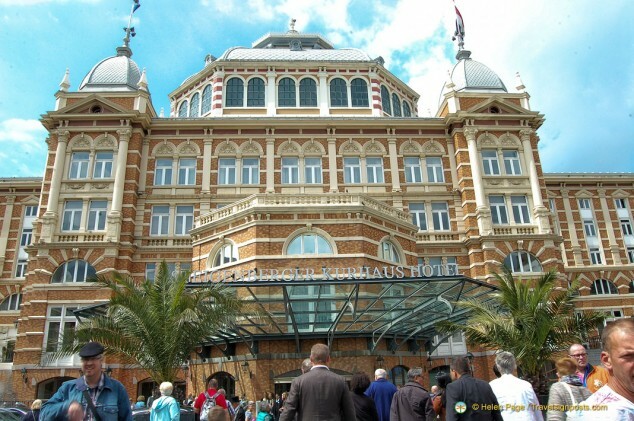 The magnificent Grand Hotel Amrath Kurhaus Hotel is one of the attractions on the Scheveningen Boulevard. This grand hotel is part of the posh Steigenberger Hotel chain and it is also the nerve center of all the action in Scheveningen. While the bootscooters may be the centre of attention today, at other times they’ve had stars like The Rolling Stones, Pavarotti and others performing here. And the Kurhaus Hotel also boasts many famous clientele. The gigantic Scheveningen Pier is an interesting walkway that stretches from the boulevard into the sea. The Pier was very popular with visitors and you could have a view of the North Sea from the top of the platform at the end of the pier. There was a restaurant, a casino, a bungee jumping platform as well as a fun house for children. Unfortunately the Pier was closed in 2013 due to safety concerns, but is expected to reopen to the public in Spring 2015. The long Scheveningen coastline has plenty to offer visitors. The boulevard beach is the most popular with tourists and locals as there are many restaurants and beach clubs here, whereas surfers and water sports fans may prefer the beach close to the harbour. But Scheveningen is not just a beach for sun-seeking visitors. Its harbour is shared between pleasure-seekers and the fishing fleet which comes back into the port at about 6 am. Once the fish is sorted by size and weight, a fish auction takes place at about 7 am. About 20 million Euros of fish is traded every year from here. 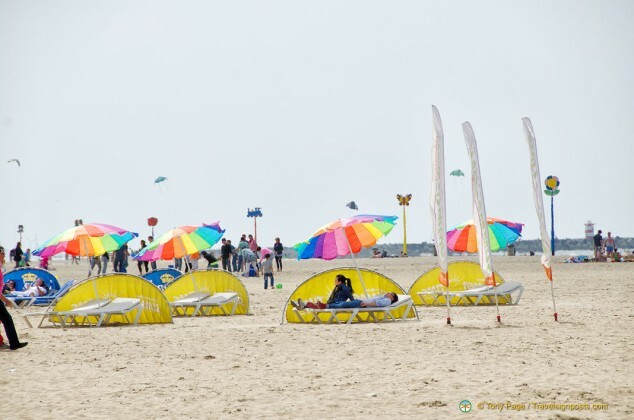 With all the activities and plenty of dining options, it’s easy to see why Scheveningen Beach is a top resort for the Dutch. 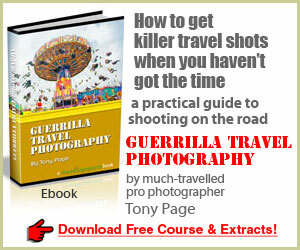 And for us, the quick stop here was an eye-opener to another side of Dutch tourism that we don’t frequently hear about. Some popular beachside places to stay include De Pier Suites, Alta Mar Studios and the Grand Hotel Amrath. See more Scheveningen Beach photos Here. Hi Helen, could you get in touch with me? Much appreciated.